1 of 4 Heat oven to 375 degrees F. Coat a 13 x 9 x 2-inch baking dish with nonstick cooking spray. 2 of 4 In a small bowl, combine salt, pepper, thyme, nutmeg and cayenne. In another bowl, combine cheese and garlic. 3 of 4 Layer half the butternut squash in dish; sprinkle with 1/2 teaspoon seasoning and 1/2 cup cheese mixture. 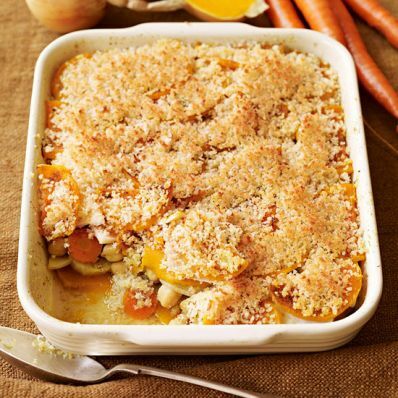 Layer parsnips and carrots over squash and season with 1/2 teaspoon seasoning and 1/2 cup cheese, followed by chickpeas, onion and 1/2 teaspoon seasoning and 1/2 cup cheese. Top with turnip, remaining butternut squash and seasoning. Pour chicken broth over top. Cover with foil and bake at 375 degrees F for 60 minutes. Remove foil and bake for an additional 30 minutes. 4 of 4 Combine panko and olive oil. Sprinkle evenly over vegetables. Broil 45 seconds or until lightly browned. Let stand 10 minutes. Per Serving: 5 g sat. fat, 8 g fiber, 15 g pro., 41 g carb., 13 g Fat, total, 25 mg chol., 687 mg sodium, 328 kcal cal.